← Georgia plays Clemson in Five Weeks: Who has the coaching edge? 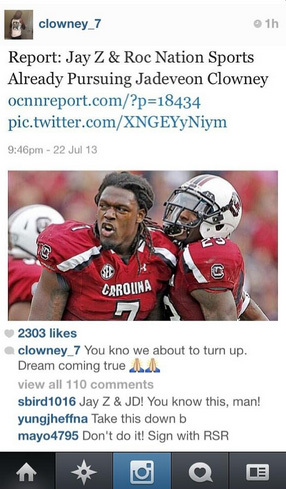 Posted on July 26, 2013, in Blog, Georgia Bulldogs, SEC, South Carolina Gamecocks and tagged Jadeveon Clowney, South Carolina. Bookmark the permalink. 5 Comments. If no agreement was signed or verbally agreed to, and no money changed hands, no rule was broken, and it’s a non story. That said, if you believe no agreement was signed or verball agreed to and no money changed, then I have ocean front property in Iown for sale. IT’S A BUYER’S MARKET! Can you write that contract up in your own handwriting on a napkin? That’s the South Carolina way to make things official! Yeah, not the most astute Tweet, nor the best press release…. but the wierdest off-season occurrence? How about Manziel shunning the Mannings or wanting out of A&M, or the ACC qb’s proclaiming to be the best in the land? Is everyone so concerned about Clowney that maybe collectively UGA, Clemson and the lot can generate a mind meld to keep him off the field this fall? I doubt it, but if so… that would be pretty weird. 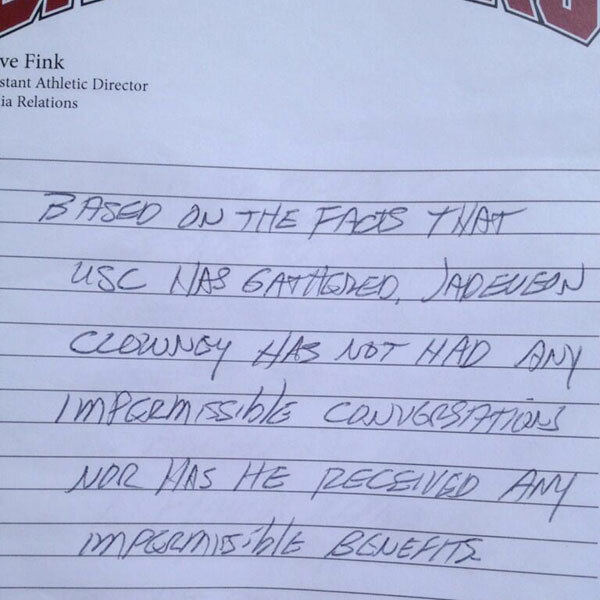 BTW, if UGA doesn’t beat Glemzon, there will be an NCAA directive disallowing a victory over USC. And even if achieved, it will be turned back in … like returning a lost wallet or something. No explanation necessary. I am conflicted regarding this whole thing. I want to play USCe at full strength so the fans won’t say UGA was lucky but after the A J Green situation I want so vindication. You can’t tell me that Clowney paid his own way during the entire time he was with Mr. Z and that an agreement wasn’t discussed. If the NCAA doesn’t take action their credibility will move into the red as far as I am concerned.